This is a light and healthy recipe to kick off your new year. 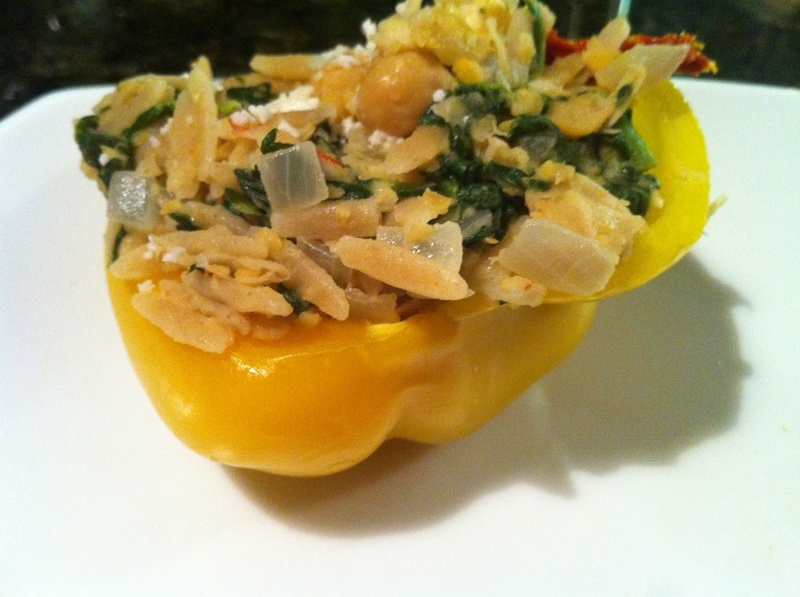 We really enjoyed these stuffed bell peppers and to my surprise they were filling too. 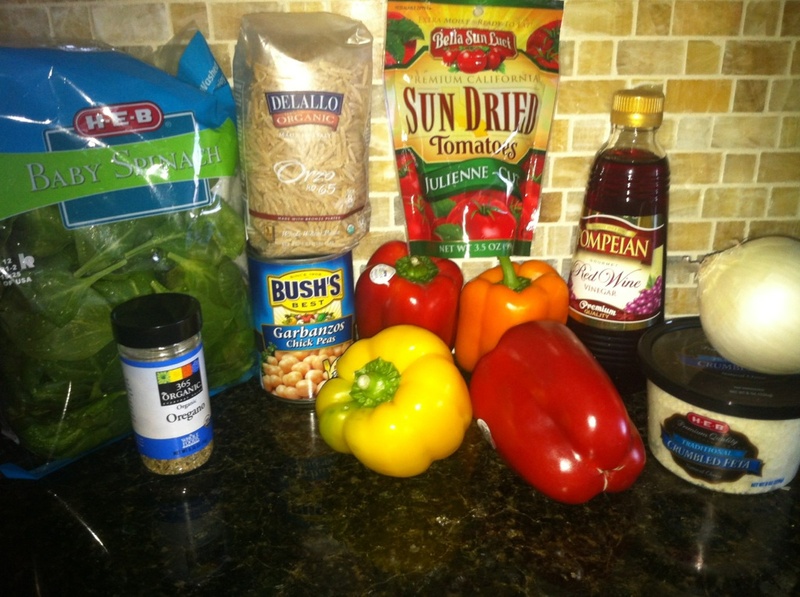 This recipe serves 4 or 2 with lots of left overs! Halve the peppers lengthwise through the stems, leaving the stems attached. Remove the seeds and white membrane. 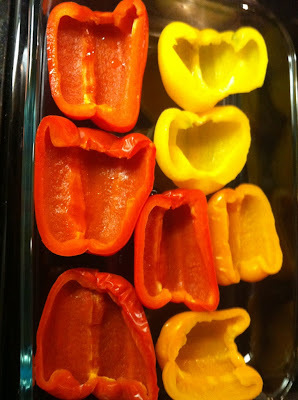 Place the peppers in a large microwaveable dish. Add 1/2 inch of water, cover with a paper towel and microwave on High for 7-9 minutes, until the peppers are softened. Let them cool slightly, drain and set aside. Bring a large saucepan of water to a boil. 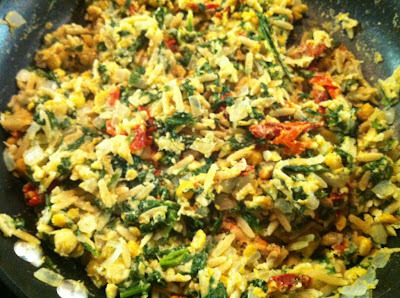 Add orzo and cook until just tender, 8-10 minutes or according to package directions. Drain and rinse with cold water. Drain and rinse chickpeas. Pour the chickpeas back into the can and mash them with a fork into a chunky paste, leaving some of the chickpeas whole. Heat olive oil in a nonstick skillet over medium heat. Add onion and cook until soft for about 5 minutes. Add spinach and oregano and cook until the spinach is wilted, about 1 minute. Stir in the orzo, chickpeas, 1/2 cup feta, tomatoes, vinegar and salt; cook until heated through, about 1 minute. 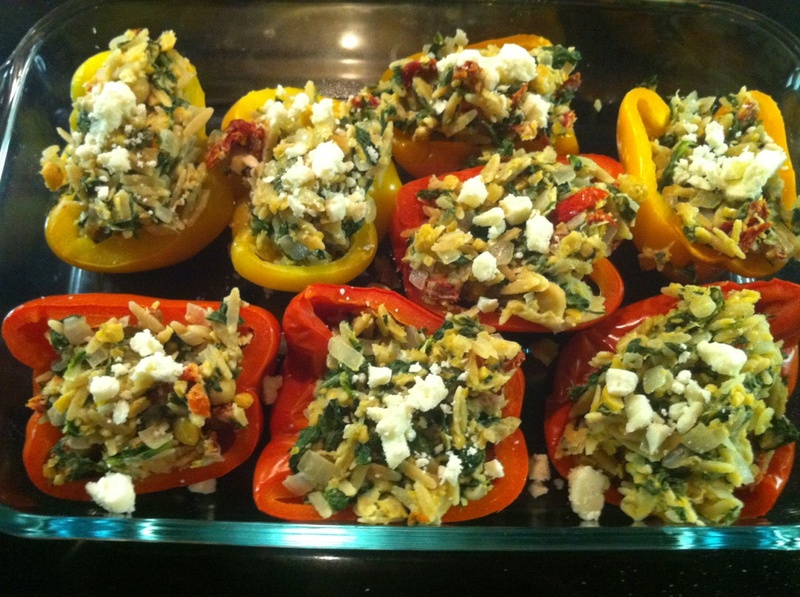 Divide the filling among the pepper halves and sprinkle each with some of the remaining 1/4 cup of feta cheese. You can serve the peppers with a garden salad or sliced pita bread!